While designing your kitchen or bath, the amount of options available to you can be overwhelming. This can include selecting the perfect countertop material for your lifestyle. 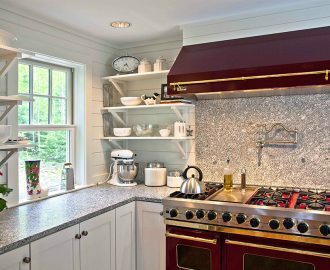 To help determine which countertop material is the best fit for you, consider the following. The most popular choice for kitchen and bathroom countertops, granite is extremely durable and resistant to scratching and staining. Additionally, it displays good heat-resistant properties (though it’s never recommended to place hot items directly on any countertop material). Granite gives you the ability to have a more carefree attitude toward the use of your countertops. 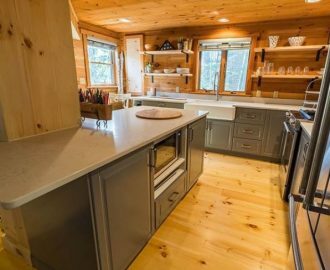 While granite is traditionally thought to have a consistent, grained appearance, there is a variety of colors and patterns available. This gives you the opportunity to select a stone that suits your personal tastes. Granite is able to accept all finish types including polished, honed, and antiqued/leathered, further extending its aesthetic versatility. Given the expansive range of granite types, the cost can vary from economical to high-end; it is generally considered to be one of the most economical options when selecting stone for your home. A stone steeped in history and culture, marble is renowned for its beauty and workability. Marble can deliver an ornate appearance to your home that most other stones cannot achieve. While the ambience marble creates keeps it a popular choice in home design, its physical and chemical properties can slightly dampen its appeal. Marble is a high maintenance stone; it is susceptible to scratching and staining and most harsh chemicals/acids are prone to etching the surface. 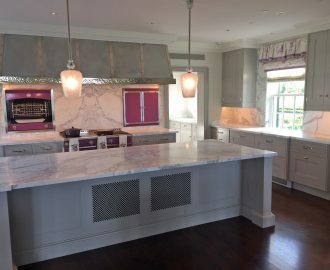 It is often recommended to use marble in low-traffic areas, however that does not stop it from regularly appearing in the form of kitchen and bathroom countertops. Like granite, marble can accept both a polished and honed finish. While the maintenance of this stone can seem burdensome, the inherent beauty and unique nature of marble are thought by many to far surpass its shortcomings. If you are sold on having marble in your home, selecting if for your bathroom vanity tops can be a fitting option; lack of acids from cooking and over-all less traffic allow marble to keep its luster longer in the bathroom. Bridging the divide between granite and marble, quartzite can span a wide range of physical properties and aesthetics. It generally possesses the superior durability and etch-resistance of granite, while offering similar color ranges and patterns as marble. Its physical durability makes it an ideal choice for high-traffic areas such as kitchen countertops, though quartzite’s natural resistance to staining expands its use far beyond solely countertop applications. While not as popular as granite, quartzite should be considered a strong contender if you are looking to bring a unique look and feel to any area of your home. Renowned for its use in traditional farmhouse sinks, soapstone can also add great beauty to your home as countertops. Soapstone is known for its “soft” feel, however that also means it can be easily scratched. 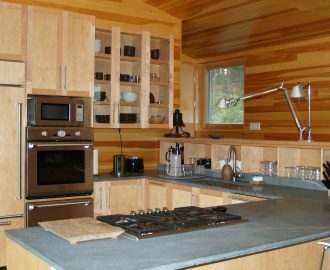 Despite its low scratch-resistance, soapstone is highly etch and heat resistant. While it can be easily worked and accepts a range of surface finishes, it cannot display the same mirrored finish as marble and granite when brought to a polish. Overall, soapstone’s unique texture and terrific heat and chemical resistance can make it an ideal choice when you want to bring a traditional style to your home. Well-known for its structural strength, the application of late extends far beyond chalkboards and roof shingles. Slate comes in a range of colors and is very consistent, which is ideal if you want a stone without strong veining or variability. Despite slate’s natural strength, it is prone to surface scratching. It does, however, possess extremely high chemical resistance making it a good choice for both interior and exterior application. If the surface scratching is not a concern of yours, slate is another fitting option for a traditional style home. Engineered stone products are offered by a wide variety of companies, each with their own proprietary process for producing slabs possessing properties considered by some to be superior to natural stone. Since engineered stones are man-made, their physical and chemical characteristics are highly consistent and controlled. Generally, they are very resistant to scratching, staining, and etching. Depending on the brand, engineered stones are often available in many patterns that can mimic the characteristics of natural stone. Another draw to this product is its environmentally friendly production; engineered stone is considered to be more “green” than natural stone. As previously mentioned there are many companies that produce engineered stone products. It is important to thoroughly research each company before selecting your desired engineered stone. While designing your kitchen or bath, the amount of options available to you can be overwhelming. While designing your kitchen or bath, the amount of options available to you can be overwhelming. the amount of options available to you can be overwhelming.